Time Warner Cable and Brighthouse Customers Can Now Activate in the ABC App! Woohoo! Time Warner Cable and Brighthouse customers can now activate in the ABC app! 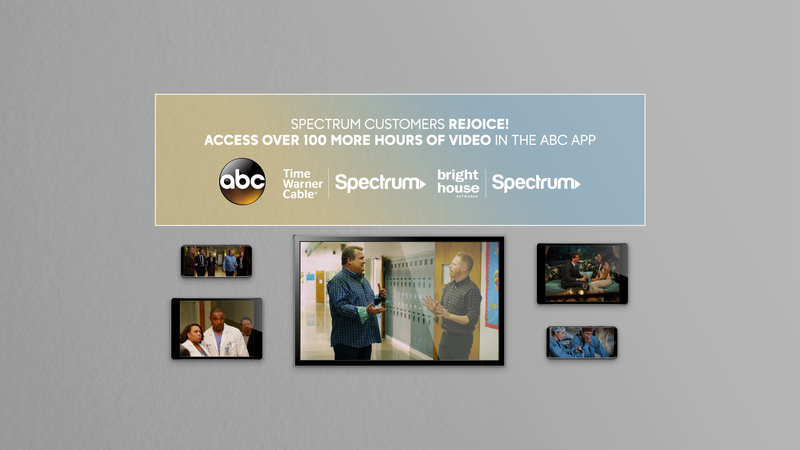 We are pleased to inform you that Time Warner and Brighthouse customers, now part of the Charter Spectrum family, can unlock over 100 MORE hours of their favorite ABC shows like Modern Family, Grey's Anatomy, Scandal, The Bachelorette and more! This includes next-day access to aired episodes and fans can also watch the ABC live stream* to catch up on their local news or tune-in to can't-miss live events like The Oscars® or NBA Finals. In order to start watching, you must select your provider from the full list of providers. Simply sign in to ABC activate with your TV provider and start watching! *Live streaming available in Chicago, Fresno, Houston, Los Angeles, New York City, Philadelphia, Raleigh-Durham and San Francisco. Hit our FAQ page if you have any questions. Below is a sampling of just some of the fun you're in for with the best ABC has to offer. We have a new president. His name: Tom Kirkman. Jimmy Kimmel takes on a 12-year-old spelling be winner.